Repairs, hydrates, and renews your skin as you sleep. 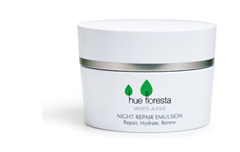 Night Repair Emulsion blocks the enzyme reaction that causes pigmentation as it moisturizes and encourages cell renewal. So you wake up to fresh and radiant skin that feels healthy and supple. Apply in sweeping upward motion on clean face and neck area. Use nightly.